The I-Pro Home antenna is a vertical dipole for the bands from 40 to 10m, incl. WARC bands. 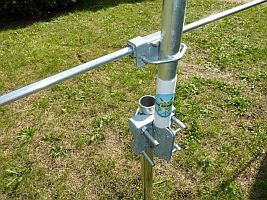 Due to the design as vertical dipole the antenna does not require any radials or counterpoises, making it very well suitable for an installation with little available space. Vertical dipoles have the benefit of very low ground losses and reach a high efficiency. The low radiation angle makes the I-Pro Home well suitable for DX traffic. 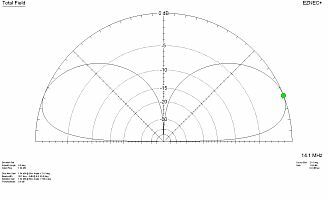 The horizontal top capacities are required for shortening the antenna and a to achieve large bandwidth. The horizontal tubes aere 250cm long. 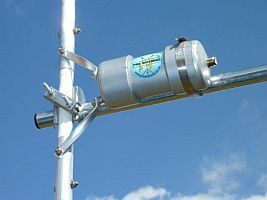 The I-Pro Home vertical dipole is 5m high and can be installed by a single person in under 30 minutes. For fixed installation a ground peg with approx. 100 to 150cm length is required. 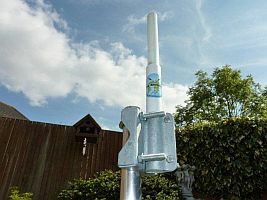 The supplied mast bracket supports a diameter of up to 55mm. A glass fibre tube is used for insulation against ground. The antenna is simply mounted on this glass fibre tube and can be unmounted within seconds, for example during an absence over the weekend. The antenna does not require ground radials or counterpoises. An additional guying might be required in windy regions, e.g. on a mountain or near the coast. Operation with the I-Pro Home is possible from 40 to 10m, incl. WARC bands. On 40 and 30m, the antenna offers limited efficiency and requires an external tuner with a wide tuning range. Due to the non-resonant design a tuner is required for the other bands as well (internal or external). The antenna is made from airplane aluminium, all screws are stainless steel, the mast clamp is galvanized steel. Assembly and installation is possible in under 30 minutes by a single person. The weight of the I-Pro Home antenna is 4.5kg, height is 5.0m (plus height of ground peg). Max. TX power is 400W PEP.